The CG point affects the stability of the aircraft. To ensure the aircraft is safe to fly,the CG must fall within specified limits established by the manufacturer. 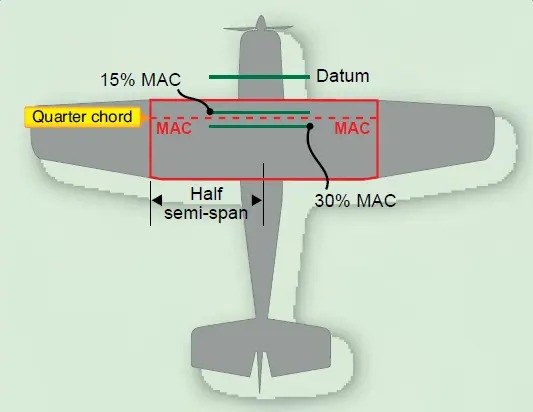 On some aircraft, the CG is expressed as a percentage of the length of the mean aerodynamic chord (MAC) or “percent MAC.” [Figure 2-14] In order to make such a calculation, the position of the leading edge of the MAC must be known ahead of time. Figure 2-14. Center of gravity expressed as percent mean aerodynamic chord. CG limits are specified forward and aft and/or lateral (left and right) limits within which the aircraft’s CG must be located during flight.The area between the limits is called the CG range of the aircraft. The position of the fore and aft CG limits is measured as a percentage of MAC from the MAC leading edge. Usually for a single or two-seat aircraft, the most forward position would be forward of 30–35 percent MAC. Thus, the allowable CG range in a light aircraft should not exceed 20 percent MAC. Note: For a rectangular width of constant airfoil section dimensions, MAC is just the chord. For a symmetrically-tapered wing, it is the average of the root chord and the tip chord.